Function Provide mechanical Cable Retenti on & Electrical Wire continuity via Armoured Wire. Finish Brass Finish, Nickel Finish, Chrome Finish or as specified . Accessories Matching Accessories available like PVC Shrouds, Lock Nuts, Earth Tag, Reducers, Adaptors, etc. as per the requirement. Function Provide for Environmental Seal in the Cable Outer Sheath. Also provide mechanical cable retention & electrical continuity. 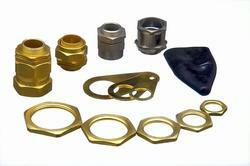 Accessories Matching Accessories available like PVC Shrouds, Lock Nuts, Earth Tags, Reducers, Adaptors, etc. as per the requirement. Made out from premium quality brass, the offered range of these Brass Transformer Parts has been widely appreciated for its sturdy compositions and dimensional accuracy. The offered range is proved to be effective in transmission of electrical energy from one circuit to another. Customers can avail this range from us in the most competitive price range. We put forth the best-in-class Brass Cable Glands for our valued clients. 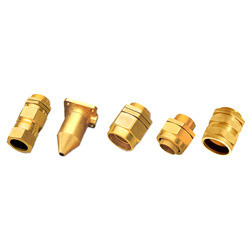 Manufactured using supreme quality brass and other required basic material, these products are in compliance with the defined parameters of the industry. To cater to the diversified demands of the clients we offer these products in different sizes and other specifications. 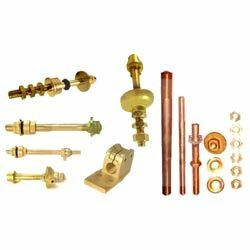 Our esteemed customers can avail from us the finest Electrical Brass Cable Glands an economical price. We use high-grade required basic material for manufacturing these products. Designed to perfection, these products are in compliance with the listed parameters of the industry and prevailing contemporary market trends.